An angle bay window or elegant, gently-arched bow window can make your home feel bigger and brighter. And because this is the fourth year in a row that Soft-Lite achieved this elite Partner of the Year recognition from the EPA and Energy Star, they moved to the “Sustained Excellence” level of award for the second year for their continued leadership in protecting the environment through superior energy efficiency achievements. 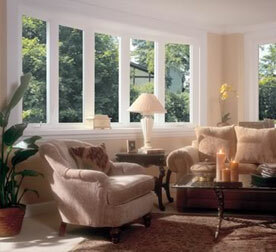 Bay and Bow windows are combinations of casement and picture windows that project outward. This style dramatically enhances your home’s beauty! It opens up your room to a new dimension and feeling! It adds a lot of extra light! No other windows can change the look and feel of a room like the Bay or Bow window! An angle bay window or elegant, gently-arched bow window can make your home feel bigger and brighter. Our bay or bow windows can be used to replace existing bay or bow windows or can be installed in most other large window openings. Think of adding a bay or bow window as a quick and easy room addition. Bay windows are available in a 3-lite or 4-lite style with double hungs or casements on the sides. 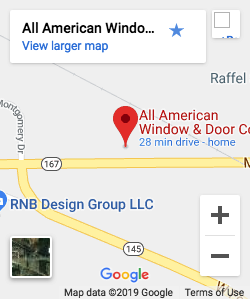 Bay windows are available with a 35 degree or 45 degree angle. Best of all, the large center picture window allows a bright and cheery view of the outdoors. 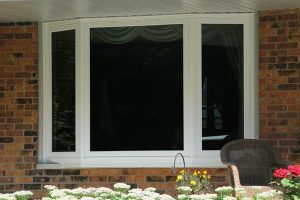 Bow windows offer soft elegance and regal charm to your home. Narrow sight lines give you maximum glass exposure and lots of light. Bow windows are available in 3-, 4-, 5- or 6-lite configurations with casements in any section. Let your imagination soar. You’ll be delighted with the results. Bay and Bow windows feature a 1-1/4” furniture-grade thick clear birch or oak wood on the head, seat and side jambs which can be stained or painted to the shade of your choice. Our custom insulated seat board also adds increased energy efficiency.